Scientists have discovered that “supercooled” water transforms into a new form of liquid, a “liquid-liquid” phase transition that is important for understanding basic processes during cryoprotection. Researchers at the University of Arkansas have identified that water, when chilled to a very low temperature, transforms into a new form of liquid. Through a simulation performed in “supercooled” water, a research team led by chemist Feng “Seymour” Wang, confirmed a “liquid-liquid” phase transition at 207 Kelvins, or 87 degrees below zero on the Fahrenheit scale. The findings were published online July 8 in the journal Proceedings of the National Academy of Sciences. 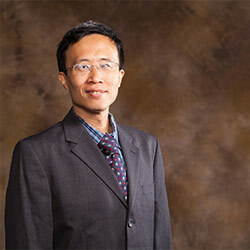 Wang wrote the article, “Liquid–liquid transition in supercooled water suggested by microsecond simulations.” Research associates Yaping Li and Jicun Li assisted with the study. The liquid–liquid phase transition in supercooled water has been used to explain many anomalous behaviors of water. Direct experimental verification of such a phase transition had not been accomplished, and theoretical studies from different simulations contradicted each other, Wang said. The research was supported by a National Science Foundation Faculty Early Career Development Award and by a startup grant from the U of A. The University of Arkansas High Performance Computing Center provided the main computational resource for the study. 1 Comment on "Researchers Discover a New Form of Liquid"
does the water also turn red when that happens? ?